Fab photos, that lamp reminds me of Narnia! Lovely, wintery look to it. Great photos, like the way you have put the lamp one over the front of the bigger picture. how you put the lamp. Oh I do so love this layout Ruth, all the colours go together. Wow, I have just put my lamp pic in my photobox folder to be sent off, unfortunately it's at night, so nowhere near as lovely as this, our snow didn't last through the days much. Will have to refer back to this for inspiration. Love it. Yep, another goodun. I like the way you've layered the lamp too. Looks great. Super layout Ruth - and I, too, love that lamp. i like the snowman !! and the rabbits ,as well as the added lamp. 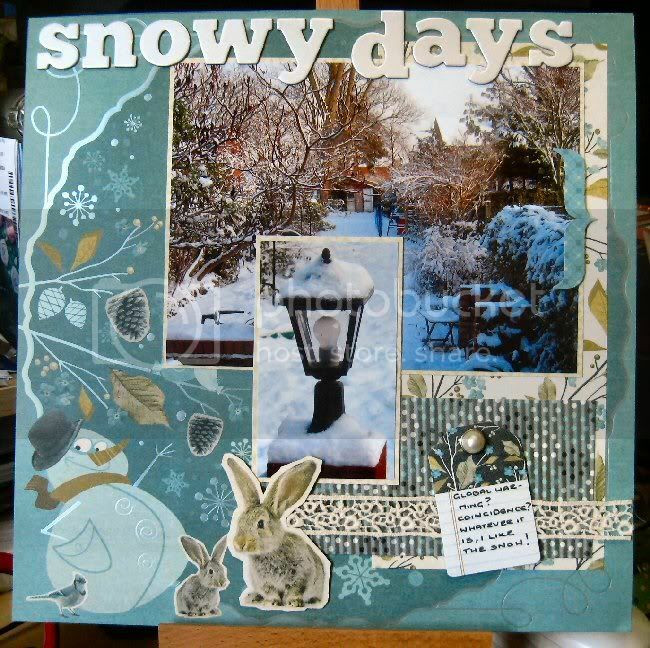 this is really lovely, am a sucker for snow layouts! Thats great Ruth, your garden is huge.